Sardine bhorta is close to taki fish bhorta. It is very easy but full of taste. 1. Open the cans and drain most of oil. Keep little of oil in that. 2. Heat the pan on low medium and add the sardine. 3. Need to stir continuously with spatula and try to spread out. We don’t want mash, we want crumbly texture. 4. Need to stir them about 15 minutes and add onion, chillies, garlic and ginger. 5. Fry it about 5 minute add salt and coriander leaves and mix them. 6. Turn off the heat. 7. 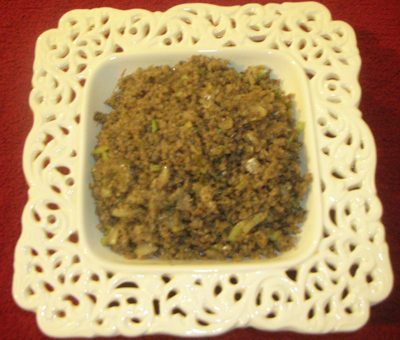 Serve Sardine bhorta with rice. ma really you want to call it “bhuna”?? i will make for then you tell me.. I just came across your website. Excellent website! Keep up the good work. I am just loving it reading your recipes. I am going to have to try some of these recipes soon. will give you feedback. Sorry It will 125 gram each can . Thanks.